Happy Valentine’s Day! I am currently in Key West on vacation as I write this post. I know, it’s been awhile. Let’s talk beauty: I’m not a big make-up girl; most days I go without much make-up, if any at all. However, when I do wear make-up, I love to have fun with it. I wanted to share my favorite make-up items of you of the moment! bareMinerals Original Loose Powder Mineral Foundation Broad Spectrum SPF 15 in “Fair”: This is a product that should be in every girl’s make-up bag! Instead of applying heavy, goopy foundation to your face, this is a good basic alternative for everyday use. If you fall asleep with it on, not the end of the world. Better yet, I am big of SPF use, and this features SPF 15 coverage. With 30 different colors, you are bound to find one that matches your skin tone. Kat Von D Tattoo Liner: I am always on the mission for a good winged eyeliner look (channeling my inner Lauren Conrad) and this product is exactly what you need for the look! At $20 a piece, it really holds up to its reputation (it is a winner of Allure’s Reader Choice Award). It features a water-proof fine tip that allows you to create that perfect cat eye (still working on perfecting mine). Benefit Cosmetics Roller Lash Curling and Lifting Mascara: I am a sucker for Benefit products; I just love the packaging! I tried this product pretty soon after it came out. I have always been a fan of Diorshow, but I find this product curls my lashes a bit more. I also have fallen asleep with this on and I don’t wake up with goopy eyes. Benefit Hoola Lite Matte Bronzer: I told you I love Benefit! This product was on my Christmas Wish List, and luckily Santa delivered. I have always been a fan of booth Hoola and Dallas bronzers from Benefit, but they were a little too dark for my fair skin tone. Hoola Lite is Hoola’s “lighter twin!” I like to use this bronzer all over my face for just a little extra color. NARS Velvet Matte Lip Pencil in “Cruella”: I finally found a good red lip! I am so excited! I have struggled with finding a dark enough red lip for years. I got a Sephora gift card for Christmas, and picked this one out. It is great for an evening red lip. 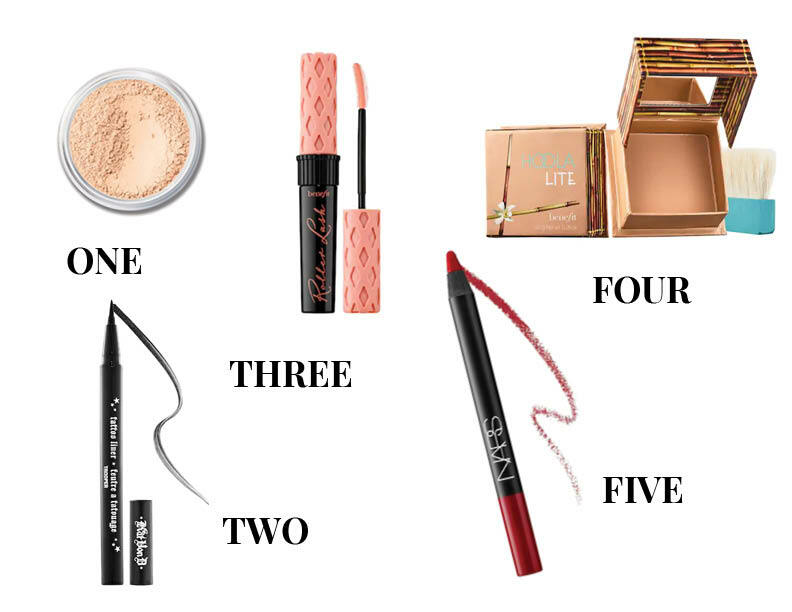 So that rounds out my favorite make-up items of the moment! What are some of your favorite make-up items that you can’t live without? 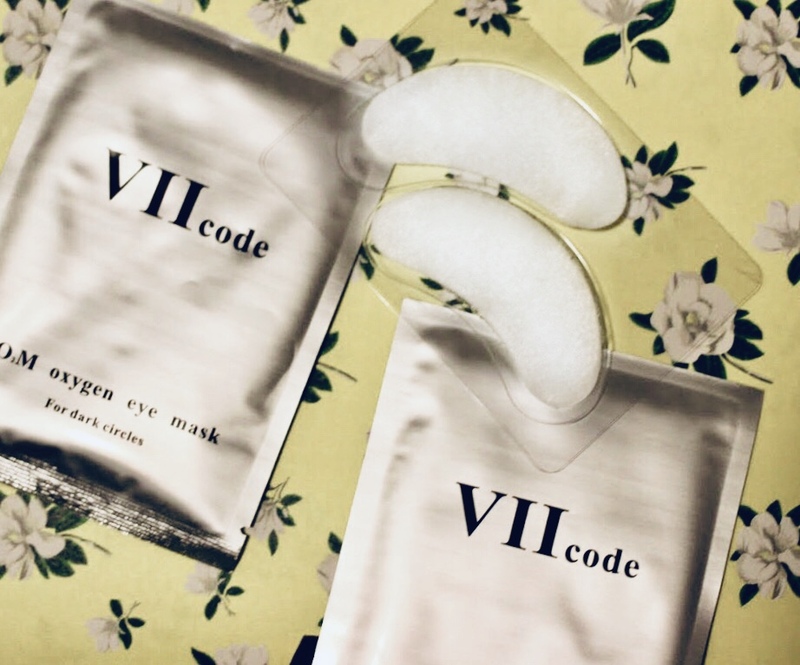 I was delighted when VII Code (pronounced “v too code”) recently reached out to me and sent me their 02M Oxygen Eye Mask for Dark Circles. I had never heard of the company before and always love to try out new beauty products. Plus, one of my New Year’s resolutions is to practice more self-care on a regular basis. Each packet comes with 6 treatments. They can be worn overnight up to 8 hours overnight. 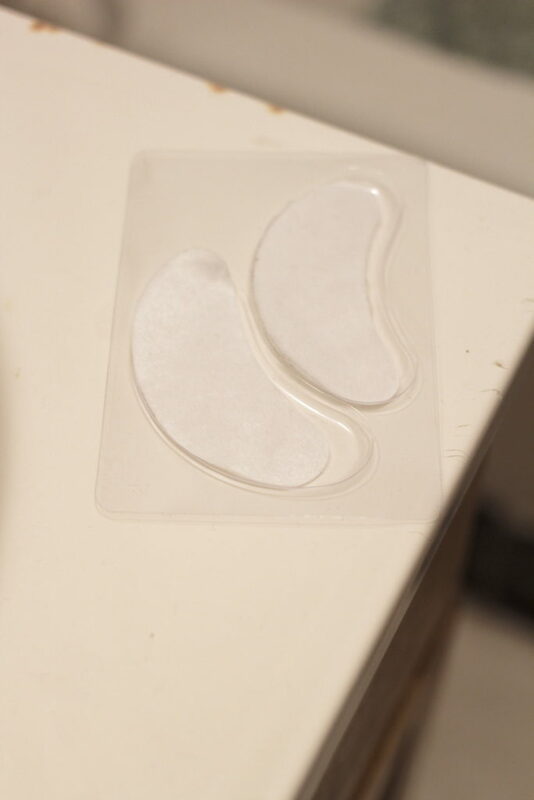 The eye masks are overall very comfortable and super sticky, so they stay on to your face without a problem. Just peel and stick them under your eyes. I personally can’t sleep with anything on my face at night, so I opted to wear the eye mask around the apartment instead for 2-4 hour periods. Treatments can be worn 3 times per week. Overall, the product really smoothed out, hydrated and brightened my skin. 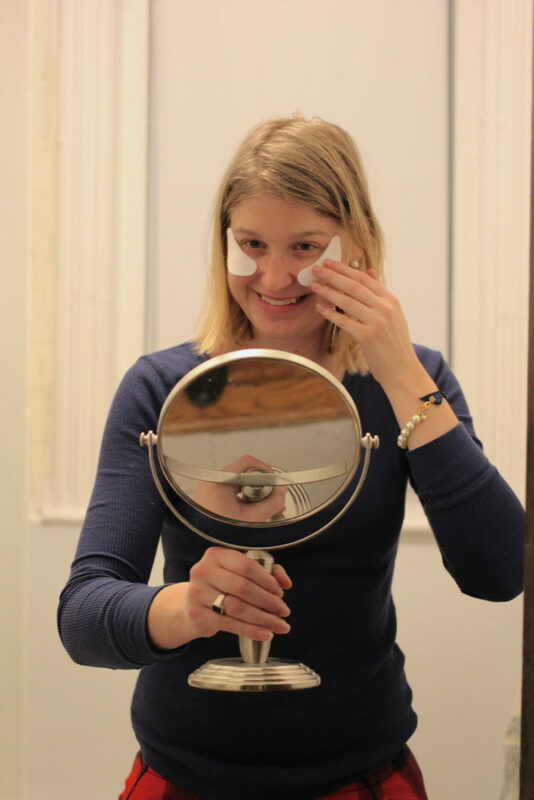 I don’t struggle too much with dark circles (luckily), so I can’t speak to that. I would definitely recommend this product for smoother and brighter skin. VII Code also offers free shipping! What is better than relaxing while wearing an eye mask while binge-watching your favorite TV show (for me, it’s the Real Housewives)?! What ways to you like to take care of yourself? Thank you so much for VII Code for sponsoring this post! Did anyone else feel bombarded by gift guides this year? Don’t get me wrong, they are a great post idea, but I felt like there were more than them than usual this year! 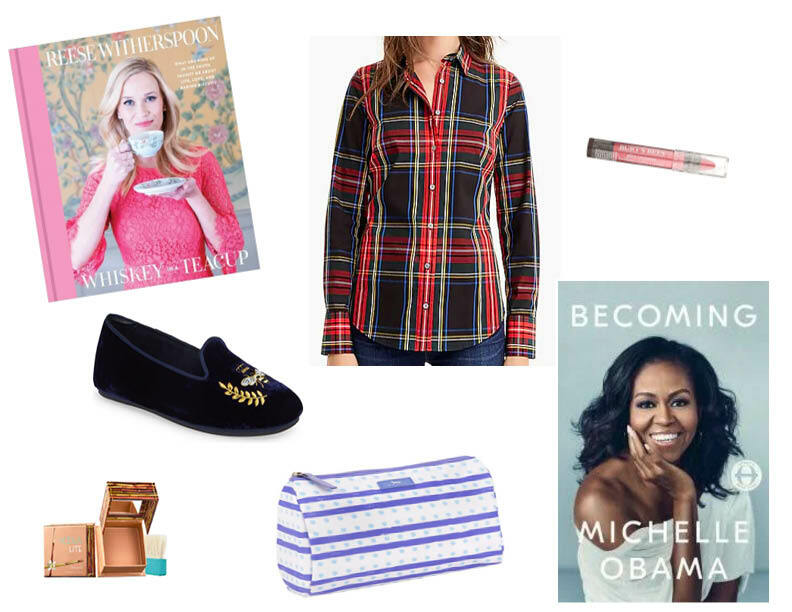 In lieu of a gift guide, I decided to share my Christmas list with you this year. And honestly, I meant to do it earlier, but couldn’t get my act together! I have wanted this book for a long time, and decided to wait until Christmas to ask for it. Truth be told, I already bought it for myself because I found it at TJ Maxx for a great price. It makes a great coffee table display and I can’t wait to dig in! I recently saw these on Oh So Lovingly’s insta and knew I had to have them (I mean, c’mon, they have bees on them!). I am always on the hunt for cozy flats. Get them here. I have been in need of a bronzer for a while now, and I love Benefit Cosmetics. I have used the “Hoola” and “Dallas” bronzers in the past, but found them a bit dark for my skin complexion. I was delighted to see that there is now a “Hoola Lite” in a lighter shade. I have had my makeup bag for longer than I would like to admit. This make-up bag from Scout comes in a bunch of colors/patterns. It also seems big enough for all of my items! It is on sale right now, and for an extra $12 you can monogram it. I was eying Michelle Obama’s book tour, but the prices were a bit steep! From what I hear, this book is supposed to be awesome. Great, because one of my New Year’s resolutions is to read more. In addition to my bronzer, I could use a bit of a make-up overhaul. I recently spotted this Burt’s Bees Lip Crayon in “Tahitan Sunset” on one of Leigha’s instastories, and I absolutely love the shade! It would make a great stocking stuffer! Now that we are into the weekend, I am really into the Christmas spirit! I plan on traveling tomorrow to spend time with family and look forward to watching as many Christmas movies as possible (my fav is Jim Carrey’s “The Grinch”). What are your plans for Christmas this year? It’s hard to believe that Christmas is a little over two weeks away! I will soon share what is on my wish list, but I wanted to share an exciting potential gift for any young woman in your life! Take this quiz to figure out which #GIRLGANG babe you are! According to the quiz, I am a Trendsetter babe! Select how often you would like to receive the #GIRLGANG box at the end of the quiz. I selected seasonally. Be sure to enter “CaraS” as your promo/referral code to waive your first styling fee! You have 7 days to try on the items in your box! 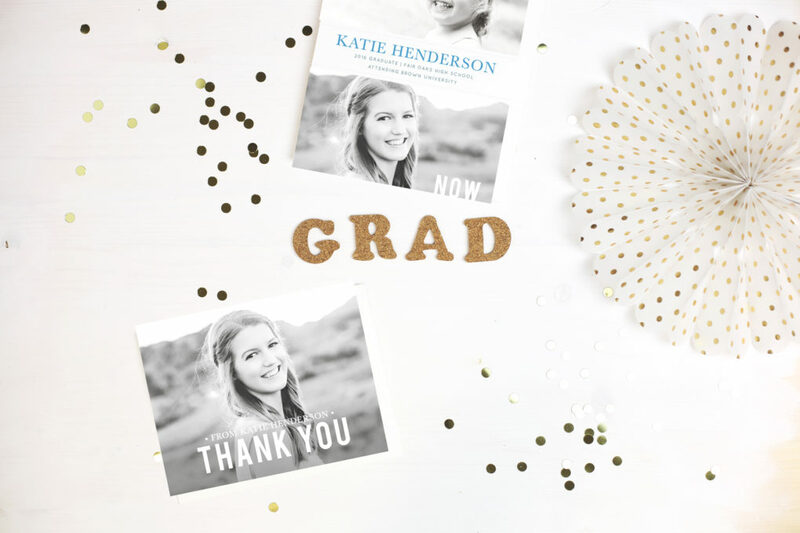 If you want to exchange something, just email Kate & Kate, and they will be happy to exchange it for you! If you aren’t feeling any particular items in your box, just send them back with the PRE-PAID shipping label! HASSLE-FREE! You will only be charged for the items that you keep. Ten percent of the proceeds from the box will go towards the Flying Kites School Network! This was a selling point for me-I love companies that give back! I received six items in my box, including this belt bag, this Tanzanite sterling silver necklace, this fun leopard scarf (pictured below; I am loving the leopard trend right now), a cozy long-sleeve tee, the Arlington Top and a blouse version of this top. I ended up keeping the scarf! All of the clothing lines that the Kate’s use fall under at least one of the 4 categories: Women-Owned, Made in North America, Eco-Sustainable or Gives Back to Charity. 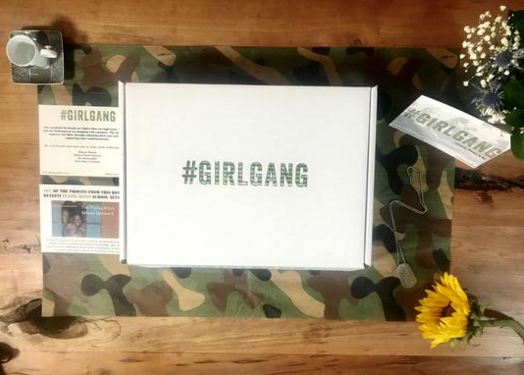 There are plenty of subscription boxes out there to choose from, but what really convinced me to order the #GirlGang box is a) The fact that the first styling fee is waived b) I am a regular Sloane & Ivy customer. I know Kate & Kate are carefully curating my box, and it isn’t determined by some algorithm c) the return shipping label makes this hassle-free and d) Ten percent of the proceeds go back to charity! 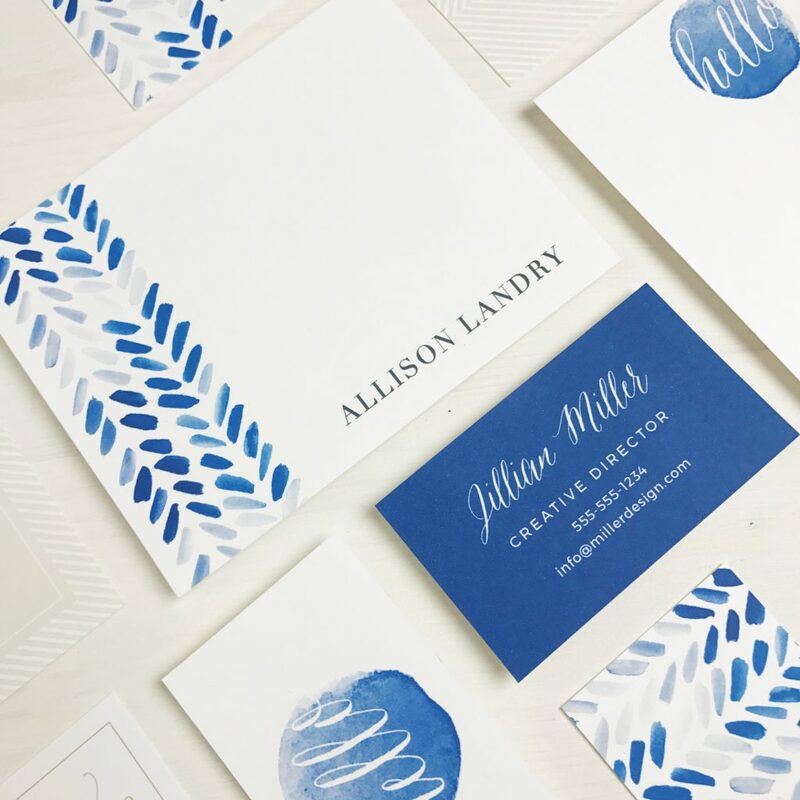 For the month of December, Sloane & Ivy is offering free shipping! Just be sure to order by December 17 for UPS and December 20 for USPS to ensure Christmas delivery! Can you believe Thanksgiving is already here!? I am down at the Cape writing this post while overlooking my parents’ cranberry bog and it is so picturesque! I am preparing for tomorrow’s festivities with family. I can’t wait! Here is my game plan for Thanksgiving! The Outfit: My friend Gigi of Fashology talked about the importance of wearing a “comfortable yet cute” look for Turkey Day. Finding the right outfit is always such a struggle! The last thing that I want to feel on Thanksgiving is self-conscious. The past few months I have been really into jumpsuits, as you may have seen in a couple of my posts. I am continuing with that trend with this cozy, budget-friendly jumpsuit from LC Lauren Conrad with a cardigan and Target mule slides. The Food: So many delicious things to eat! I got this cool festive pan with pumpkin bread mix from Williams-Sonoma. I also will be making this Autumn Brussels Sprout Salad recipe from Kate of DomestikatedLife.com. I can’t wait to see how both things turn out. Of course, there will be the other Thanksgiving staples as well. The Tablescape: I love designing the tablescape every year. I scour Pinterest looking for the perfect design. My last table design was based on this one from Lauren Conrad. This year’s tablescape will combine aspects from Lauren’s, but I am adding in the (faux) antler aspect of this design. I plan to add a little more color, bringing greens and orange pumpkins into the mix. I also plan on taking an AM yoga class to get the stay started on the right foot. What is your plan for Thanksgiving? 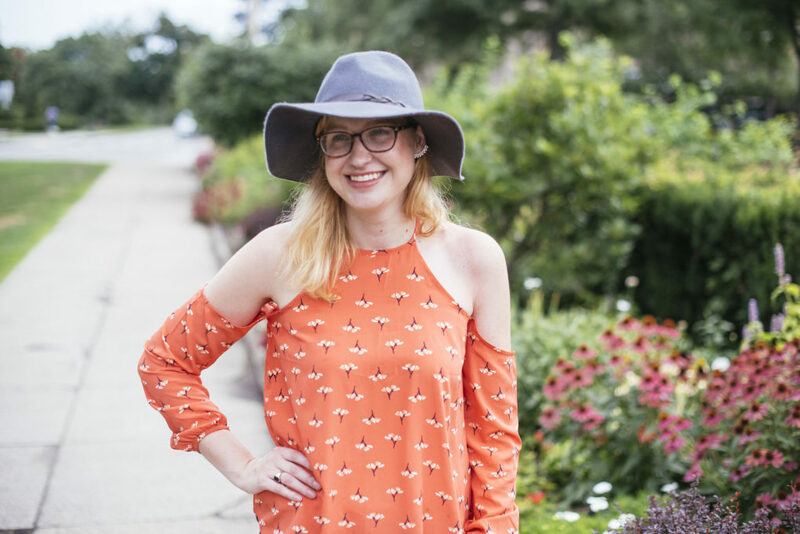 One of my favorite bloggers, Blair from Atlantic-Pacific, recently dropped a collaboration with the Halogen brand at Nordstrom. The collection is not available in all stores, but is available online. I love how Blair is constantly mixing patterns and exuding her whimsical style. If you are wondering about sizing, Blair shared a post about how sizing works. I love these glittery mules! I can imagine wearing them with a pair of boyfriend jeans (heels and boyfriend jeans are a look that I love) or a frilly tulle skirt. They retail for $99.95 and also come in tweed and black patent. Blair pairs these socks with these shoes. I also think they would look great with the mules. I love the pumps and socks look. Again, I would pair it with a pair of boyfriend jeans or any kind of midi skirt/dress. This hat exudes Blair’s girlie style. One great thing about New England weather, is there are so many winterwear accessories to play around with, like this piece. It retails for $39. 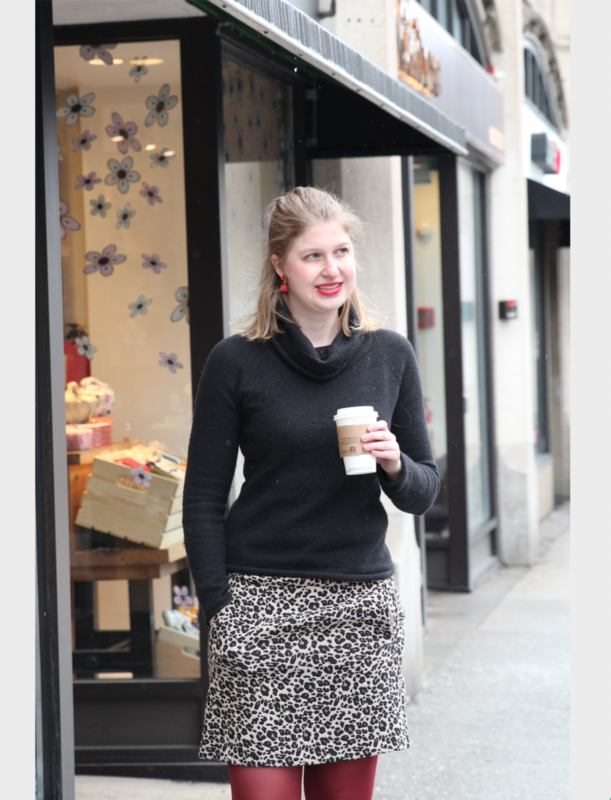 This skirt is perfect for the office. I also picture it with the socks and glittery mules for a more fun look! What I love about this collection is that all of the pieces kind of go together and it feels like playing dress up! The faux-wrap skirt retails for $89 and features gold button details. Being in New England, you always have to be on the look out for chic winterwear. 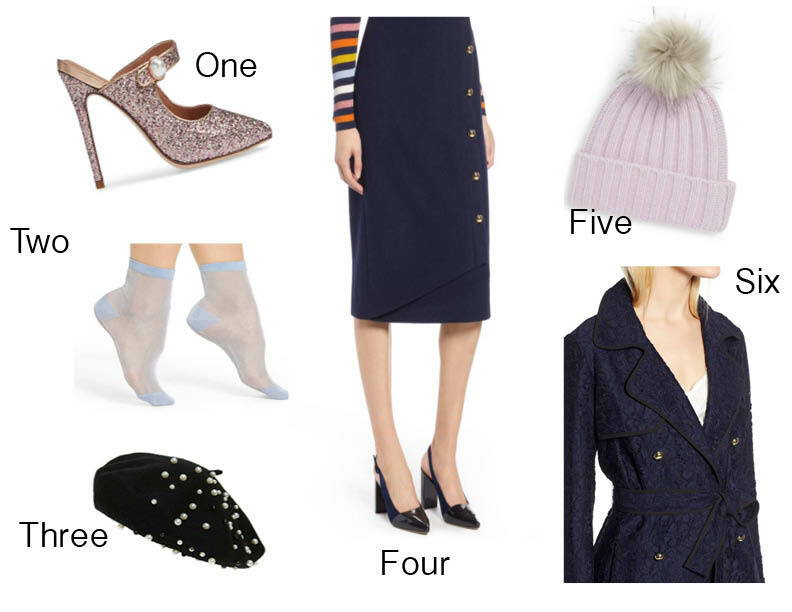 I love the knit hat and pom pom look that is trending right now, and this one is made out of soft cashmere! This hat retails for $55. I love a good trench coat, and this one is just so elegant. When done right, navy and black look divine together. This coat would look awesome with the navy skirt. It retails for $199. Overall I am loving this collection! It is selling fast, so best to hop on it! What are your favorite pieces from the collection? As a creative individual, I love crafting and DIYs. I also love fall (it’s my second favorite season, and the only reason that it isn’t my first is because it means that winter is coming). So put these two things together, and I am in my element. 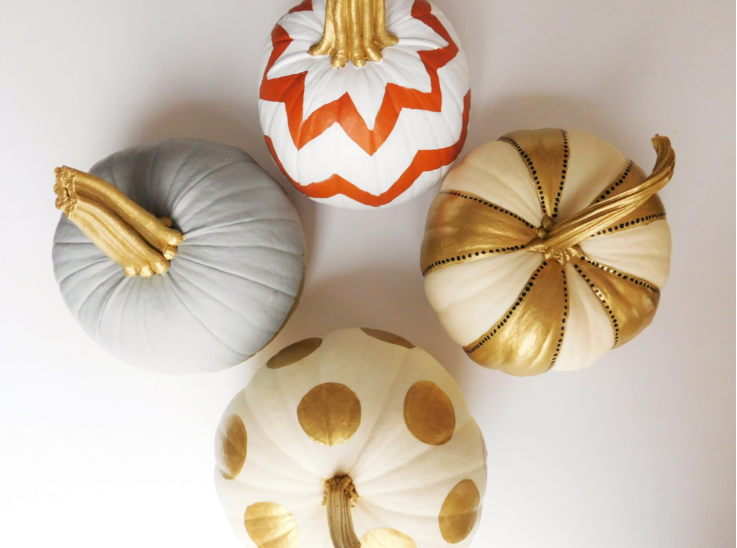 I did some research and found three easy DIY pumpkins for this fun time of year! 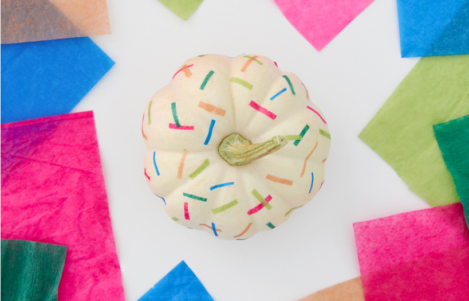 Design Fixation’s DIY Rainbow Confetti Pumpkin: Faith successfully combined pumpkins and with one of culinary’s masterpieces: the Funfetti cake. I’m in! Super easy, this tutorial requires minimal supplies and is super chic. 2. Floral Pumpkin: My mom and I made this a couple of years ago. 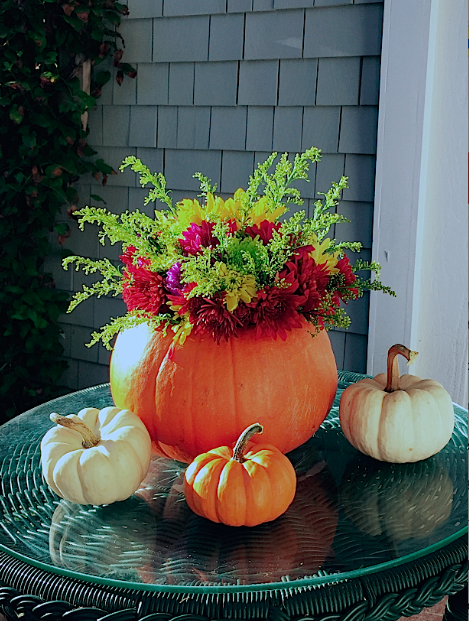 We scooped out a pumpkin and used styrofoam to hold the flowers in place-but you could also secure the flowers with a can (vase) in a carved out pumpkin. 3. The Lilac Press’s Metallic Pumpkins: I love how Leigha incorporated these metallic colors into her designs, particularly how she painted the stems. I also love how she used the natural orange of the pumpkin to incorporate into her chevron pattern. How will I decorate my pumpkins this year? The verdict is still out. Another one of my favorites? Lauren Conrad’s flower cutie from a few years back. Are you doing any fun fall DIYs right now? 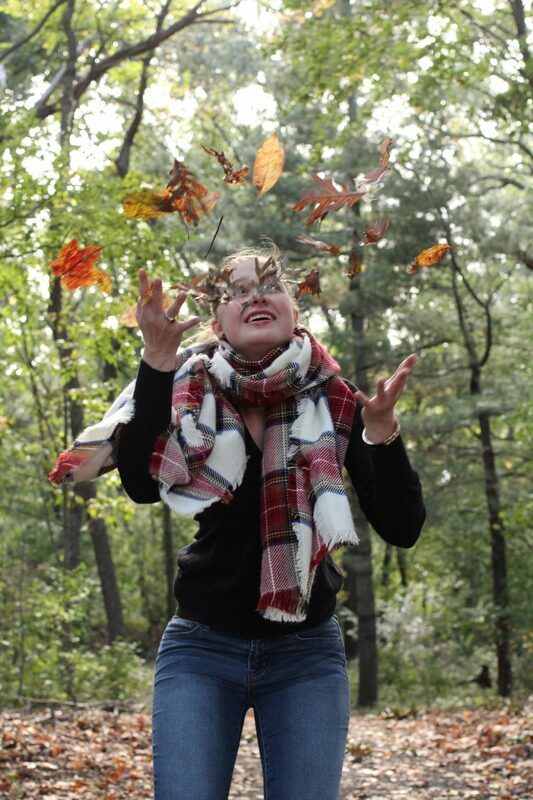 Happy fall, friends! Summer is my favorite season, but I am happy fall is in the air. I have commenced drinking PSLs and am ready for what the season has in store. How about you? Are you ready for fall or hanging on to summer? Here are the Top Three things that I am looking forward to this month! New York, New York! I spent some time interning in New York after college, and haven’t been back since 2015. I will always hold my NYC memories close, and a trip there is a trip down memory lane! Thanks to Danielle, I won a ticket to Well Summit this weekend! I have heard such good things about this conference, and cannot wait to connect with all the bloggers there. Fall: September is always a transition month for fall, but by October, fall is in full swing! I just went apple picking this past weekend, so I am totally in the fall mode. Give me pumpkin everything! We are so lucky to live in New England, where we get a real fall, complete with the perfect foliage. Halloween: Other than Christmas, Halloween is my favorite holiday. I just wish we would get trick-or-treaters at our apartment. I can’t wait to try out some fun DIY crafts while watching “Hocus Pocus.” This year, I am going to watch “It’s the Great Pumpkin, Charlie Brown” for the first time.